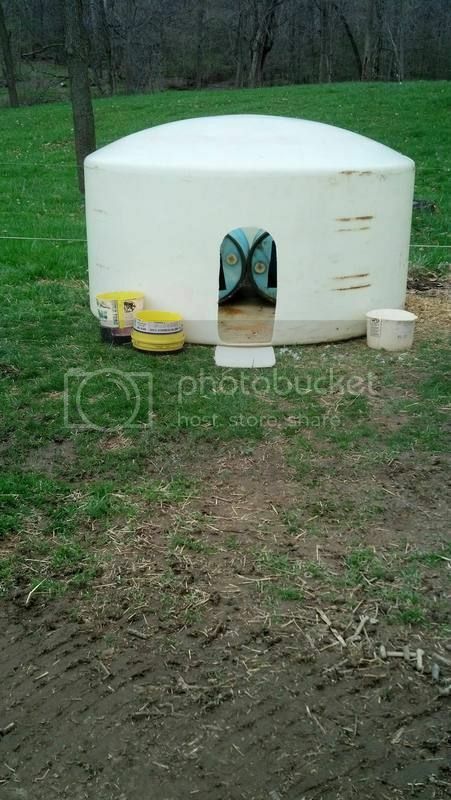 My dogs love my "igloos" Most farmers haul water in large plastic tanks - - - after 10 years there is a real danger of them exploding when you hit a bump due to exposure to sunlight - - - This is an old tank we could no longer trust. 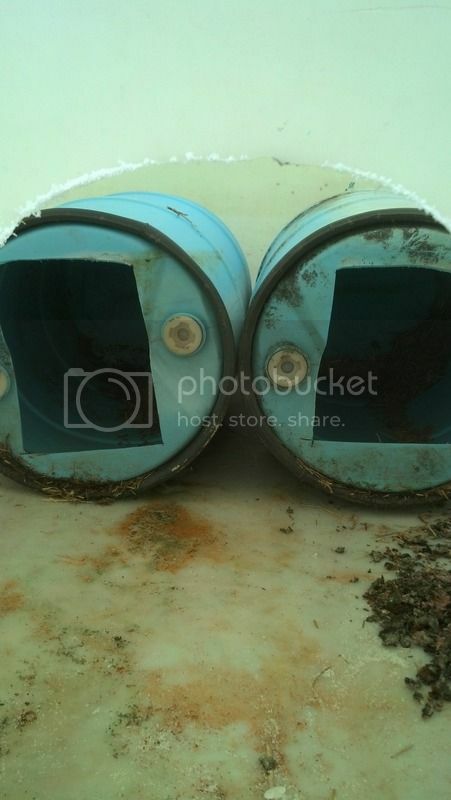 I placed two 55 gallon barrels inside - - - My grand-kids say the dogs have a living room as well as 2 bedrooms. In the summer I leave the top lid off so that warm air exhaust and pulls cool air in the door - - - in the winter I close the top lid and with 2 or more dogs all going into the same "igloo" it stays very warm, the floor is tilted to the rear and water goes out the 24" diameter opening I cut in the floor to insert the barrels, but the barrels cover the opening so the dogs have a clean dry floor to lay on. 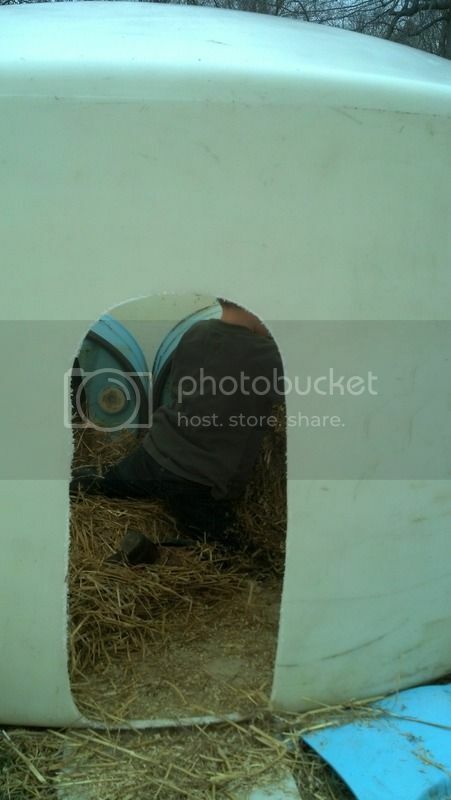 Of course the grand son keeps clean straw in the barrels. And "Tigger" gives it her stamp of approval. Her litter is due in 5 more days so she will move to the welping kennel for a couple of weeks with a heated floor for the pups. 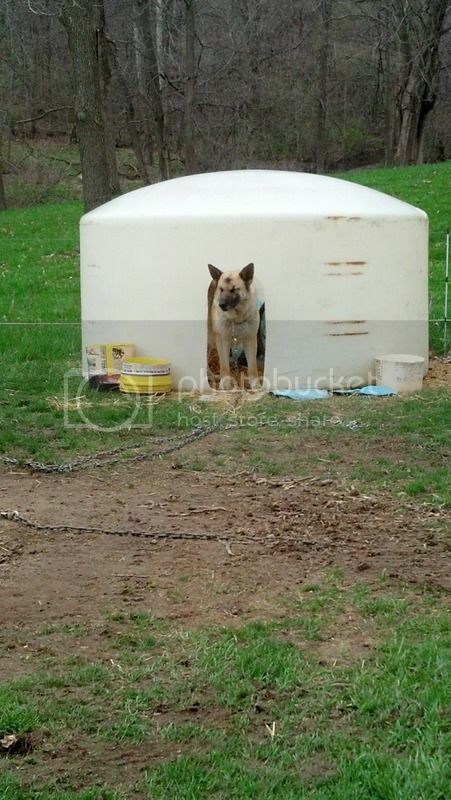 The chains are 25' from the center stake to a swivel, then 2 more 25' lengths attached to the swivel so two dogs are in the same area - - - with 50' of chain it is 100' across ( almost 1/4 th acre )and they cannot get tangled if there is nothing else around. Most of the time they are free to run in the 3 acre fenced yard. You must not get South Dakota type of winds there. That tank would have been in North Dakota today if it was here Tuesday. If you notice the trees in the background, I built in a dense woods - - - but if you go into some of the flat ground around here you would have to tie a rope on the Sally Fields or you would have a return of the "Flying Nun"
I have the cattle and dogs where they can get the south sun but avoid most of the wind!